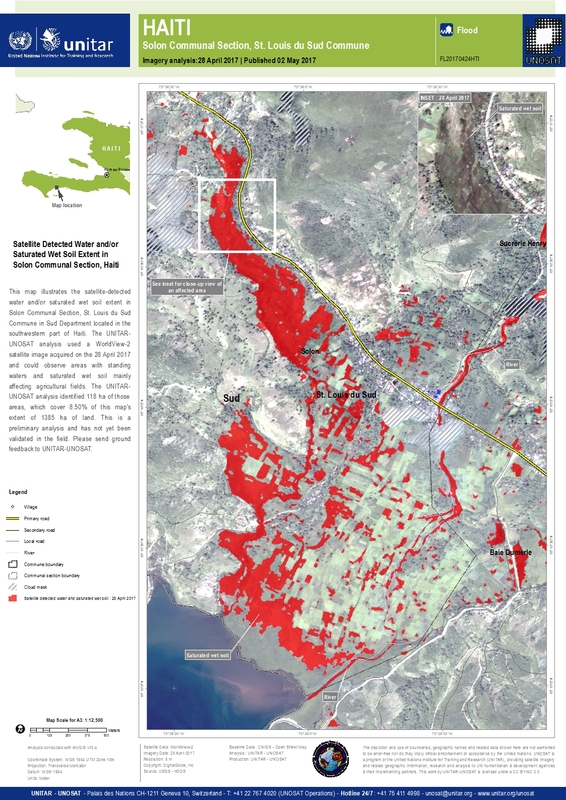 This map illustrates the satellite-detected water and/or saturated wet soil extent in Solon Communal Section, St. Louis du Sud Commune in Sud Department located in the southwestern part of Haiti. The UNITAR-UNOSAT analysis used a WorldView-2 satellite image acquired on the 28 April 2017 and could observe areas with standing waters and saturated wet soil mainly affecting agricultural fields. The UNITAR-UNOSAT analysis identified 118 ha of those areas, which cover 8.50% of this map's extent of 1385 ha of land. This is a preliminary analysis and has not yet been validated in the field. Please send ground feedback to UNITAR-UNOSAT.